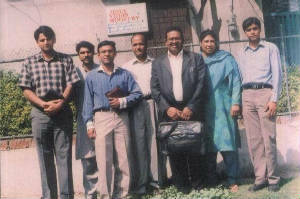 Jesus Vision Ministries (JVM) is showing His wonderful love and motivates the people towards the real Kingdom of God in Islamic Republic of Pakistan. We are involved in the Evangelism and Preaching of the message of Truth in this pro Islamic society. Christians are 1.7 % out of the total population of 149 millions in Pakistan. The need of the day is not only to evangelize the community of other faiths but also to help our born Christian brothers and sisters to accept His Truth sensibly and grow in His love to witness His Word in Pakistan. “JVM” is a non-denominational Ministry. It has been fighting against Sin, Poverty, Hunger and Ignorance. It is to prepare human for everlasting life. Our objective is to see every believer move in faith, authority, and the power of Holy Spirit, doing the same works as of Jesus did in his life. 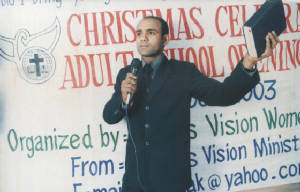 On 17 Sep 1999 Pastor Shabbir Barkat (Noel) launched into on outpouring of God’s miracle healing power and gift of tongues when he received the baptism in the Holy Spirit. Now the powerful and life changing truths of God’s word exploded in the lives of others through his dynamic preaching and teaching ministry. At the moment this ministry is working at the national level but soon we will start working at international level by the grace of God. We are working on to strengthen the people spiritually, ethically, mentally and physically according to image of the teachings of Jesus Christ because Jesus Christ came in this world for human salvation from captivity, illness and oppressed. The focus of his teaching whether in speaking or writing, is to train the believers to “step” in to their own God, giving supernatural lives and ministries. JVM trains believers to be “supernaturally natural” as they live and minister through the gifts of the Holy Spirit. We are trying to achieve our goals by the grace of God.